Easy Peasy Mac & Cheese-y. Boil your water in a large pot. It takes at least 8 minutes for my heavy pot to come to rolling boil so I do the cheese sauce while I'm waiting. In a medium saucepan, melt 2 Tablespoons of margarine on medium-low heat. Add 2 Tablespoons of AP flour and stir well until smooth. Continue to stir and let the Rue bubble for about 2 minutes to cook the flour. A little browning is okay. It will give a nutty flavour, but don't let it burn. Slowly whisk milk into the cooked rue. Add mustard powder, and salt, continuing to stir until it starts to thicken. Add cheese, stir, and remove from heat. Set this aside until your pasta is ready and drained. Add salt and pasta to boiling water, cook for about 5 mins and test for done-ness. You want it a little al dente (firm) because it will cook again in the oven. Drain pasta, and add the cheese sauce, mix well. 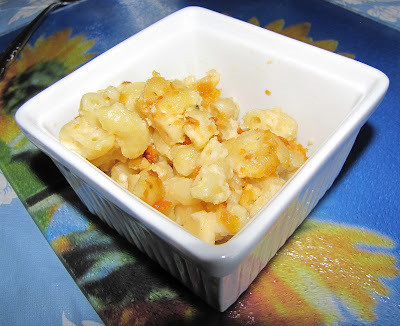 Top with crushed Cheese Nips. I use a mixture of my favourite cheeses- Havarti with Roasted Garlic, Havarti with Garden Vegetable, Sharp Cheddar, Asiago, Gruyere, Mozzarella. Add 1/4 cup cooked bacon or ham to the cheese and pasta before baking. Top with bread crumbs instead of Cheese Nips. This is my mother's traditional way of topping Mac & Cheese- 1 1/2 cups of fine bread crumbs, 1 tablespoon of melted butter, 1/2 teaspoon of sage, 1/2 teaspoon oregano.